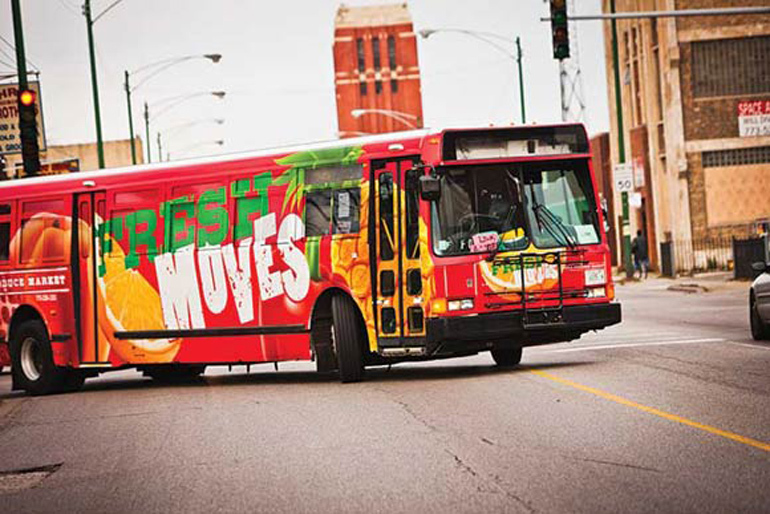 The Fresh Moves bus, designed by Katherine Darnstadt and her team, offers a four-wheeled solution to Chicago’s food deserts. It’s an early November morning in a crowded Starbucks in Chicago’s Loop, and Katherine Darnstadt (ARCH ’05) is laughing. The sound rises above the hiss of the latte machine and jazzy vocals of the piped-in music, providing a robust and rolling soundtrack to the coffee shop. Darnstadt’s unrestrained laughter bubbles forth as easily and rapidly as her words describing her views on her profession, service to society, and architecture education. She can hardly get in a breath. Founder and principal architect of Latent Design and director of Architecture for Humanity Chicago (AfHC), Darnstadt is explaining how she remains unruffled when a client tells her “no”. She instead mines such rejection as an opportunity for introspection and growth. After all, it was a “no”—as in, no job, when she was laid off in 2009—that propelled her to put her passions into action, first by volunteering with AfHC, then opening her own collaborative architecture firm whose projects focus on making a social, economic, and environmental impact beyond the bricks and mortar. Thinking critically about the long-term societal contributions of design came easy and early to Darnstadt, who grew up in Chicago’s southwest suburbs observing her father working on buildings as an electrical contractor. When she entered Illinois Institute of Technology, the Bronzeville community surrounding Main Campus was in the midst of revitalization. That climate, which included the razing of the nearby Robert Taylor Homes public housing complex, influenced Darnstadt to focus her future career on affordable housing. After graduation, she worked for three years as an architect for a local firm whose interests included affordable housing projects before she was laid off during the economic downturn, when unemployment in the industry averaged 25–30 percent. Seeking volunteer opportunities, she got in at the ground level of the Chicago Chapter of the global nonprofit Architecture for Humanity. 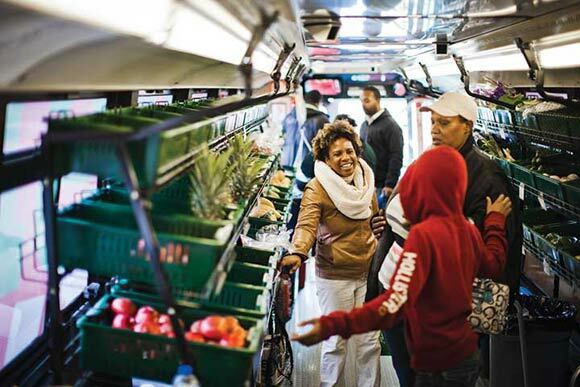 She helped to lead Fresh Moves, an affordable and innovative solution to Chicago’s food deserts—areas with limited access to fruits and vegetables—via a mobile produce market in the form of a retrofitted CTA bus. Pro bono services for clients in need are just part of the social conscience behind Latent Design. Darnstadt took cues from her social entrepreneur peers, nonprofit clients, and AfHC when structuring her firm, which also sets aside 10 percent of its profits to pay employees who have agreed to work for a reduced fee. Additionally, employees receive a finder’s fee for bringing in new projects. Many of Darnstadt’s clients come from her AfHC partnerships; nearly all of her clients seek out Latent Design from Darnstadt’s collaborations within the nonprofit sector. On some projects—such as Femme 2 STEM—Darnstadt serves as educator and design guide, empowering clients to solve their own challenges. Architect Katherine Darnstadt stands outside the recently closed Fisk coal-fired power plant. Darnstadt’s team provided the Pilsen Environmental Rights and Reform Organization with ideas for redeveloping the site. In 2011, the nonprofit organization Demoiselle 2 Femme selected Darnstadt’s firm to design a 28,000-square-foot community center for young women ages 12–18 in Chicago’s Roseland neighborhood. Discussions with the client and a focus group of potential users yielded ideas about after-school programming in art, business, and science. Out of that conversation, Latent Design helped a group of teenage girls develop STEM-based program assessment and design skills needed to convert a vacant lot into a play space. In summer 2012, the young women designed and built the Climb, Jump, Leap, and Imagine Playground in an intensive two-week workshop. Climb, Jump, Leap, and Imagine took the Grand Prize in the Metropolitan Planning Council’s 2012 Space in Between placemaking contest. Also that year, Darnstadt received the IIT Young Alumni Award and the AIA Illinois R. Buckminster Fuller Service Award for her humanitarian efforts. Darnstadt was named as one of 15 recipients of the 2013 Young Architects Award from the AIA. A teacher at the School of the Art Institute of Chicago and an advisory board member and studio professor at the city’s new Integrated School of Building, she encourages colleagues to consider how design education could be transformed to best prepare the next generation of students. Darnstadt also advises colleagues to heed what youth can teach them.